I’ve been in Milan, Italy for two and a half months—long enough to have “gotten used to it” in a lot of ways, but not long enough to simply take for granted the way things are. It seems, therefore, the right time for me to share some observations. None of this is related to what’s going on with our health situation–it’s about what surrounds it. #1. Milan is very organized. The Italians in Milan are very organized. This came as bit of a surprise to me because my experience of Italians was always the crazy ones who left the civilization of Europe for the jungles of Costa Rica. And that is one wild bunch. As one might say of Americans, the calm, sensible, reasonable, judicious ones stay at home. The Italians in Milan live in small apartments on narrow streets with small cars parked either in small parking spaces or in small “boxes” that are box-like garages that go with their apartments. Underground. The apartments have small, immaculate kitchens with small refrigerators and small pantries filled with small packages of food. Nothing comes in bulk. Small living rooms have small couches. Children (even adult children, if they live at home) sleep in single beds. You do small loads of laundry every day because there is one drying rack and you have to fit everything on it. And in Milan, to my surprise, EVERYBODY IRONS. Religiously. I kind of thought ironing was one of those things people used to do, but I guess not. #2. Trash is not just trash. Oh no. There are three types of trash, one of which is recycling, and there are three types of that. These items are disposed of separately, and no one would think of saying “the hell with it” and just dumping it all together. That’s not how it’s done. Glass, plastic/metal, and dry paper are separated (by you when you take out your trash to your building’s trash area–because if you live in Milan, you likely live in an apartment). Then there’s “wet” trash and “dry” trash. Food trash goes in the “wet” bin: egg shells, carrot peels, coffee grounds, used paper products, etc. The last category is “undifferentiated” which is everything else, which isn’t all that much. I’m told you get a fine if you do a bad job of separating your trash. I’m not sure how that works as I haven’t noticed any surveillance cameras in the trash area, but I’m trying not to find out! #3. With the exception of polenta, which might be compared to the southern USA’s grits, it seems that Italians do not eat corn. There was zero sweet corn in the markets this summer. To find corn flour for tortillas and/or cornbread, I had to go to a special international grocery store. Also, there is no frozen corn in the grocery store—only canned. This isn’t a problem for me because the main way I consume corn in in tortillas, but I do think it’s interesting. I know that corn is a grain from the Americas, I just assumed that since in the Americas we eat pasta, in Italy there would be corn. Well. There might be, but it is not in Milan. #4. Oatmeal is a special health food, not a staple. I searched the supermarket high and low for it and finally discovered small over-priced bags of plain old oatmeal tucked into the Special Health Food row between the organic fair-trade rice cakes and the organic fair-trade soy noodles. Good grief. #6. Unless there is a special pedestrian signal—the kind featuring a red person standing or a green person running—that directs otherwise, you are supposed to walk directly in front of oncoming traffic at crosswalks. Only at crosswalks, mind you, but you are NOT supposed to stand there and wait for drivers to come to a full and complete stop for you. They hate that. If you do, they will glare at you and make annoyed Italian hand gestures. They know they aren’t supposed to run over you. They’re very organized and hate anything that makes a mess, so you can trust them. They will slow down enough to keep from hitting you, and everyone continues on their merry way. And you don’t have to run, either. Just walk across the street like you own it. You do. #6. All of the history weights on people. Or maybe there’s some piece of it that I’m not able to see clearly, yet. They love their history in the same way that you might love a family member who is suffering from dementia—truly, and yet some selflessness is required in the process. Italy IS History, and to physically navigate Italy, or at least Milan, you must physically navigate through History and its mad twists and turns, reversals, successes, and failures. Nothing simply is. Everything was, and was before. 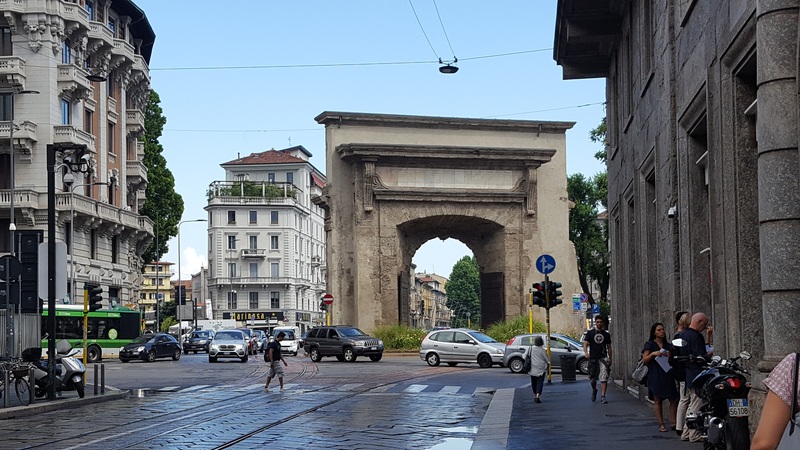 I think about this as I walk or ride around the zillions of round-abouts that are constructed to direct traffic flow around historical monuments like La Porta Romana, one of the gates that once opened into the medieval city of Milan but that now stands in the middle of it. Since you can’t tear down a thing like that, you go around it. And here, there are a lot of “things like that.” All of it acquires some weight. –City-dwellers love their plants! Every balcony and available roof space is crowded with them. –Before noon, if you want to eat something that isn’t a form of bread, you’d better eat it at home because no one will sell you anything else. –Baby strollers have the baby turned the other way facing mom/dad. Smart!! –You’re not supposed to smile and say hi to strangers. That’s not “polite” or “friendly,” that’s creepy. –“Ciao” means hi and bye, but you don’t say it to people you don’t know. To people you don’t know, you say “salve” which also means either hi or bye. And I always feel like I’m telling the persons to save her/himself which makes it hard for me to say with a straight face. –All flowers are beautiful, including “wildflowers” which would be known as “weeds” where I come from. –Grocery carts are locked together. To use one, you have to put a coin into the lock to open it. Your coin rides around in the cart with you, and when you return and re-lock it, you get your coin back. Again, smart!! Guess what country doesn’t have shopping carts all over the parking lot? La Porta Romana. One of many ways history affects daily life. Alright. I started a Go Fund Me campaign. This is to help to cover living expenses while Pio and I are here in Milan fighting the invisible monsters in his belly.